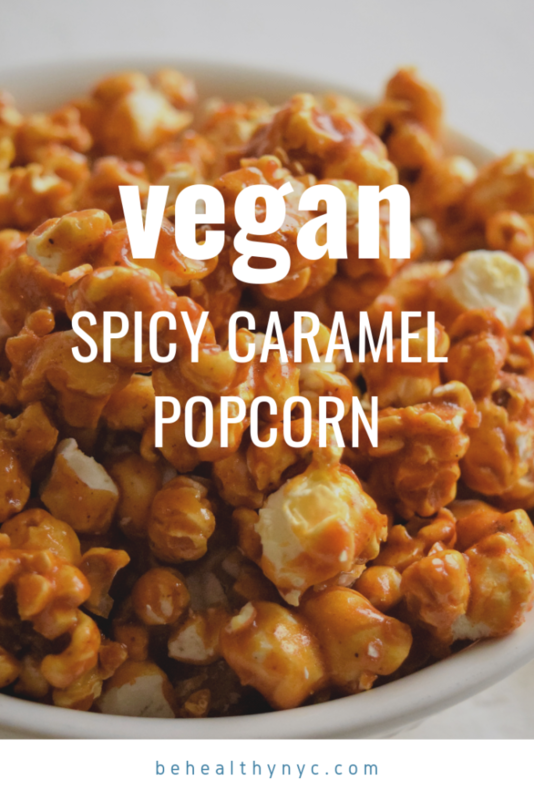 Delicious, sticky and sweet vegan spicy caramel popcorn! I saw this recipe a long time ago in a newspaper and took a picture of it with my phone. Usually, I don’t like sweet popcorn, but the thought of adding cayenne convinced me right away. I already add cayenne to everything: chocolate cakes and cookies, and especially to my savory popcorn. So I just had to make this recipe. 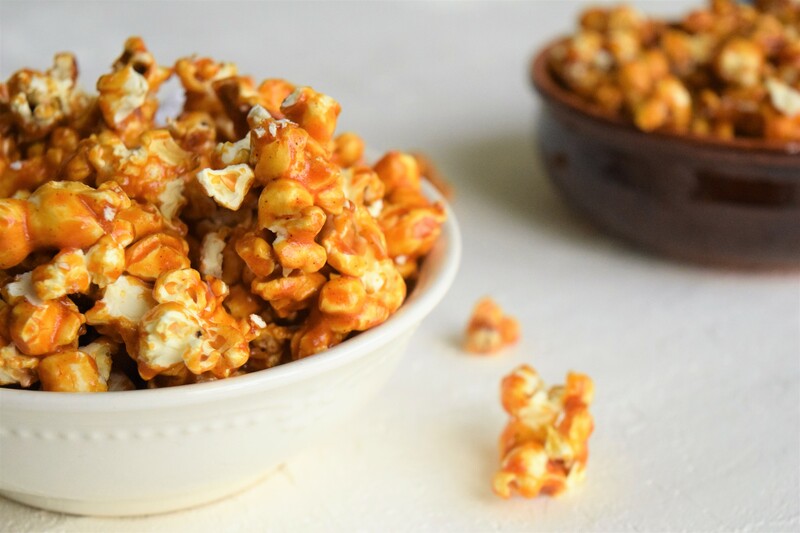 How come I never thought about adding to a sweet caramel popcorn!? The original recipe had butter, so I only had to substitute it for vegan butter. 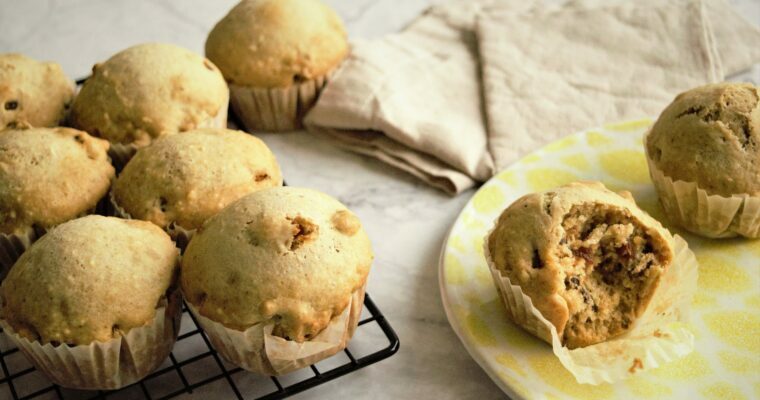 It tastes just as I remember the original to be, and though this is not a healthy recipe, for those who don’t eat or are allergic to dairy this is a great treat to indulge from time to time. When I made this recipe for the first time I didn’t spray the bowl and spatula with cooking oil, and that was a mistake. Because the caramel sauce gets sticky immediately, so you have to works quick and have the bowl, spatula, and even the baking sheets thoroughly sprayed with oil. Try to pour the sauce and stir at the same time and transfer to the baking sheets as soon as you can to avoid big clumps to form. 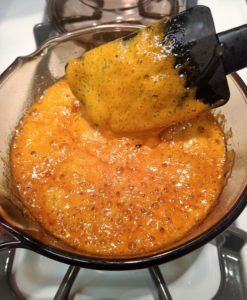 In a large saucepan or pot with a lid, heat the oil over medium-high heat. Add the popcorn kernels, cover and keep the saucepan moving until all of the kernels have popped about 5 minutes. Transfer to the prepared bowl, removing any unpopped kernels. Using a small bowl, whisk together the baking soda and cayenne pepper. Have two large baking sheets ready. In a medium saucepan, combine the sugar, butter, salt, and 1/2 cup water. Cook over high heat, without stirring, until the mixture becomes a light golden caramel, 10 to 14 minutes. Remove from the heat and carefully whisk in the baking soda mixture (the mixture will bubble up). 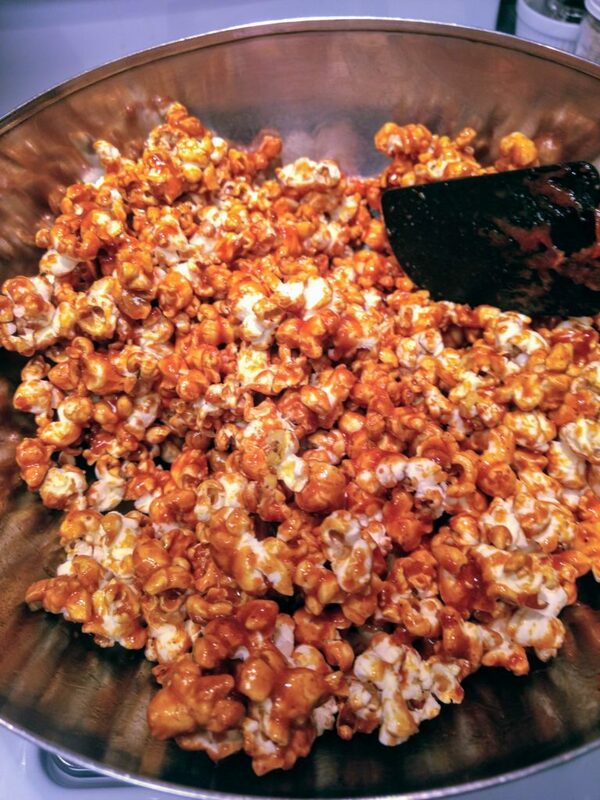 Immediately pour the caramel mixture over the popcorn. 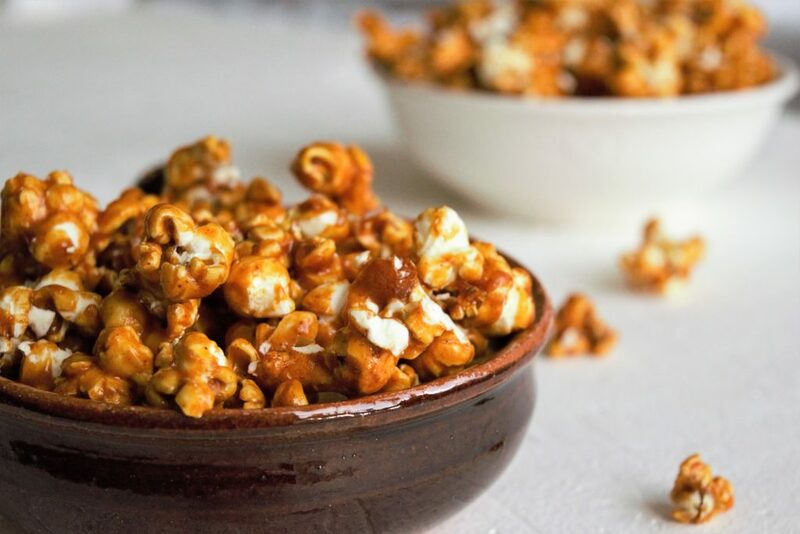 Working quickly and carefully, use the prepared spatulas to toss the caramel and popcorn together, as if you were tossing a salad until the popcorn is well coated. The color of the caramel doesn’t need to be so dark as mine. I let it cook a bit longer than the recipe suggested because that’s how I like my caramel. Yours will probably be a touch lighter. Let the popcorn sit for about 10 minutes (or as long as you like) to cool, and break any big clumps. 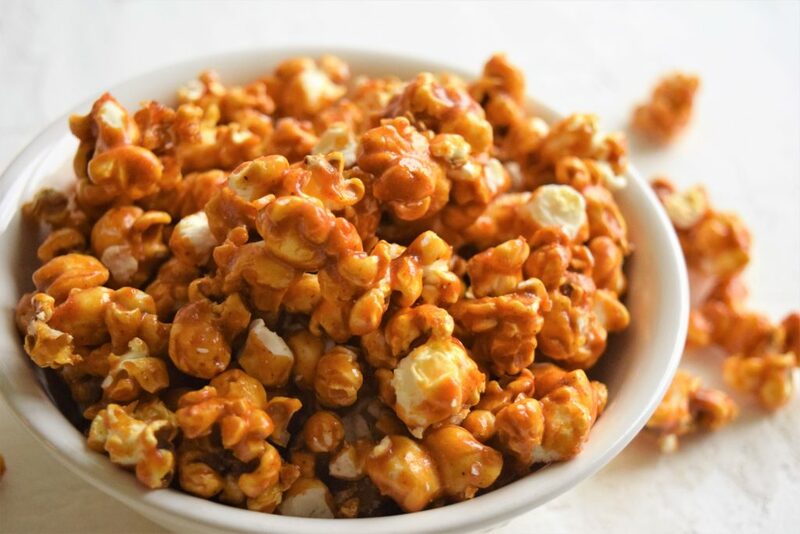 One thing to keep in mind is to remove all unpopped kernels before pouring the sauce. 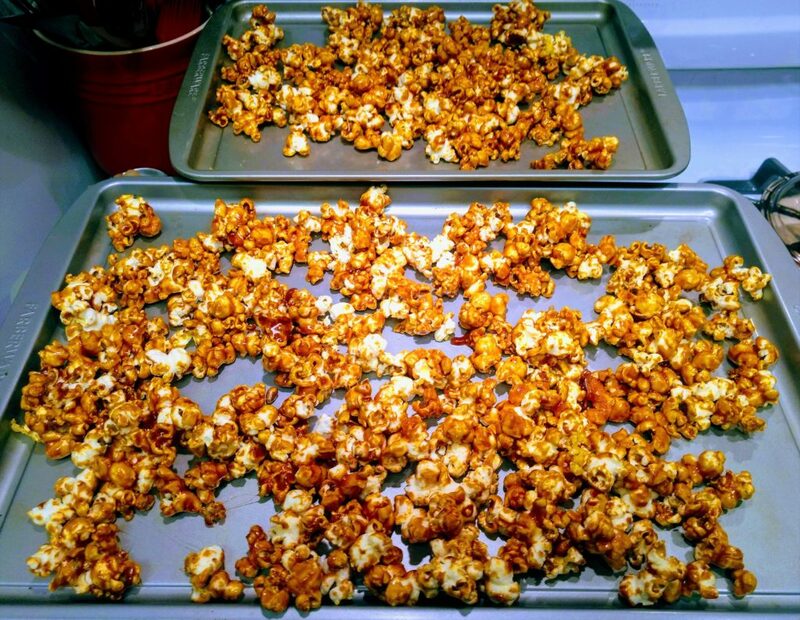 I had quite a few I didn’t remove, and it was very unpleasant to find them hiding within a cluster of caramel and popcorn. If you have a tremendous will power you can store the popcorn in an airtight container in the refrigerator for 2 weeks! Which is perfect if you have kids. 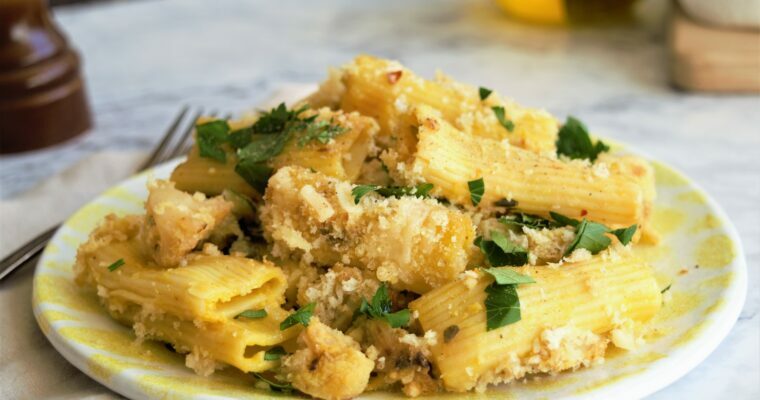 I have made this recipe several times, and it always works. Next time I’ll add peanuts to it!! !